Have you heard yourself expressing just how tired you are – once, twice, maybe 3 times a week? Fatigue is turning up everywhere – not just in recovery. I’m hearing people express just how tired they are, a lot. It’s turning up in our every day conversations, a lot. As a business owner this concerns me. As a health professional this concerns me. And as a road user this concerns me greatly. When we think about the types of conditions that cause fatigue, it’s a bit alarming because our workplaces are full of people living with multiple conditions where fatigue is likely to be present, and this should raise concern for us as to the capability of the people in our workplaces. If we think about mental health, most people I’ve ever worked with who are living with depression or anxiety, or some type of mental health concern, will tell me that living with their condition is exhausting. The same goes for people living with chronic pain, they will tell me that trying to manage their pain is exhausting. And we all know that anyone living with a cardiovascular disease, whether that’s directly related to their heart or they’re at risk of a stroke, or they’ve had some type of event, they will tell you that they’re exhausted during their recovery period. Not to mention people living post cancer. Now, some of the statistics that we know – and these are old – these are back from 2015-2016. If we’ve got one in five people around us living with a mental health condition ; we’ve got one in ten people living with chronic pain to the point where they can’t work for at least one day a month . We’ve got one in five people living with a chronic cardiovascular disease causing some level of fatigue . Let’s not forget people who are living with newborns, people living post cancer, people living with a range of autoimmune diseases. There are a lot of reasons that our energy is being compromised before we turn up for work. If you looked around your workplace, there’s probably 1 in 4 or 1 in 5 people who are not performing at their best because they are fatigued, and no amount of rest is actually going to help them perform better. No amount of inbox zero; no amount of yoga at lunch time, no amount of daily inspiration. We’ve got to come up with better solutions for helping people manage their energy. Energy is at an all-time premium. We have so many things that are demanding of our energy. This is turning up for us physically, cognitively, and emotionally. Not everybody responds to fatigue the same way. What we’ve got to start with is finding out how fatigue is affecting the individual. Is it physically? Because everybody thinks that that’s what it is, but quite often it’s not. A lot of people report cognitive fatigue as being the most disabling effect of their fatigue. But then there is also this thing called emotional fatigue. Where a person’s emotional demands are not being considered and they don’t have the resources, the skills and strategies to be able to cope with the ever-increasing demands on their emotional energy. Fatigue doesn’t mean we can’t work! Not at all. However, we need to rethink how we help people manage their energy. When we focus on energy management, you will find that people will be able to do more with the energy that they have. There’s a lot to think about, but I think the important thing to realise is that it’s everywhere, and it’s in all our workplaces and it’s in our colleagues, and it’s not just in the people we’re helping return to work after a period of absence through illness, injury or trauma. There may be a lot of reasons why people are struggling to meet their energy demands for a day. However, there are quite simple and easy to implement activities that we can put in place to help people use the energy they have more effectively. And wouldn’t that be a great answer, to be able to use the energy you have more effectively. Jo is passionate about helping people make work work well. 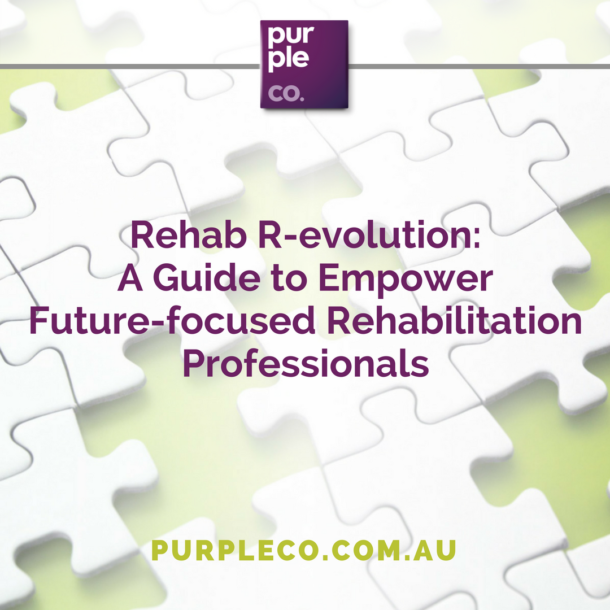 Jo is an engaging speaker, coach and the founder of Purple Co, a team of specialized allied health professionals who help people reclaim their lives and return to work following injury, illness and trauma. Jo is also the author of the book The Entrepreneurial Clinician.